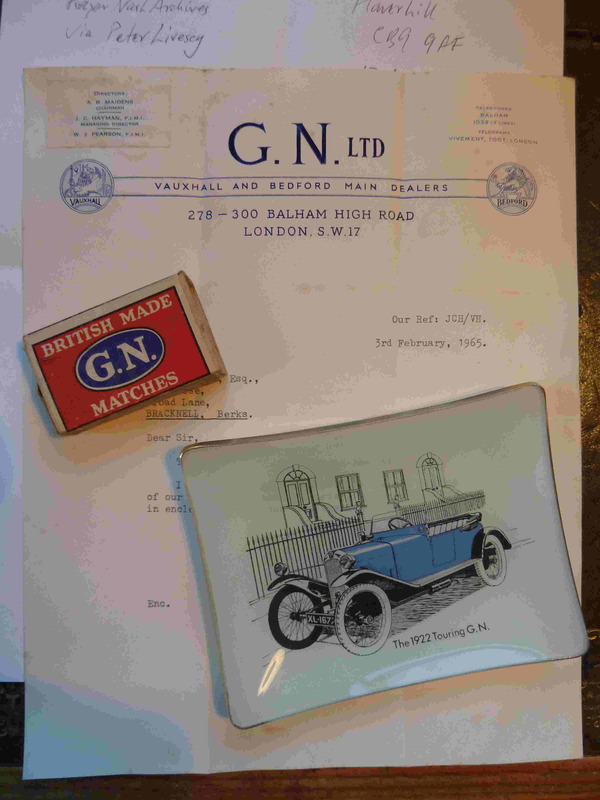 We have received a very kind donation from Club member Keith Bowman, comprising a letter to him dated 3rd February 1965 from GN Ltd, a box of "GN" safety matches and an ashtray with an illustration of a 1922 Touring GN. The address on the correspondence is that used by Ron Godfrey when he ran GN Ltd from Balham High Road in the late 1920s, and the typeface used appears identical, almost 40 years later. Keith had written to GN Ltd to ask if they would send him a diary but, as the letter indicates, they no longer had any of their motoring diaries and sent the ashtray instead. The safety matches were readily available in Yorkshire in 1963 when Keith was in Leeds taking some exams. All we need now at the Archives are some well-used leather chairs, a faded Indian rug and a well-stocked bar and we could offer a traditional club atmosphere, complete with pipe smoke!